Phillies pending free agent Jose Bautista tells FOX Sports’ Ken Rosenthal (video link) that he plans to continue his career in 2019, which would be his age-38 season. Bautista would like to suit up for a contender next year, Rosenthal says. Considering his output dating back to 2017, Bautista may not be in position to dictate the type of team he plays for next season. While he was among the game’s most feared sluggers as a Blue Jay from 2010-16, Bautista’s now set to finish up his second straight less-than-stellar offensive campaign. Still, Bautista has been roughly average this year by FanGraphs’ wRC+ metric (101), having compiled an unusual .199/.339/.370 line in 384 plate appearances as part of a National League East tour that has seen him play for the Braves, Mets and Phillies. While he’s not exactly a defensive standout, Bautista has racked up plenty of action in the outfield and at third base, and that versatility impressed Mets manager Mickey Callaway, Rosenthal notes. Further, Rosenthal adds that Bautista has been a valuable mentor during his short stay in Philadelphia – which acquired him from New York less than a month ago. Since the end of 2015, his last great season, Bautista has totaled just 1.5 fWAR in 1,588 PAs. Bautista’s days as a quality regular appear to be over, then, though he could continue serving as a useful bench bat in 2019. The right-hander has long offered similar offensive production against both same-handed and southpaw pitchers, which has been the case this season, and still possesses respectable power (12 home runs, .171 ISO) and patience (15.9 percent walk rate). And with a .344 expected weighted on-base average against a .317 wOBA, Statcast suggests Bautista has deserved somewhat better than the middling offensive output he has posted in 2018. It emerged earlier today that Mets third baseman David Wright would appear with the organization’s top affiliate as he continues his rehab assignment. That seemed a good sign after a two-day rest period for Wright, perhaps even indicating that he would be readying for a return to the majors late this year. In comments this afternoon, however, assistant GM John Ricco suggested that the organization hasn’t necessarily put in an order for a fresh #5 jersey top. As MLB.com’s Anthony DiComo was among those to cover (all links to Twitter), Ricco also announced that the team will not promote top first base prospect Peter Alonso this fall and gave the reasoning behind the club’s decision to trade away veteran outfielder Jose Bautista. The 35-year-old Wright last saw action in the majors in May of 2016, but has continued to try to battle through a series of significant medical impediments in hopes of making it back. He was written off by most entering the year, and still faces long odds to return to being a player truly worthy of occupying a MLB roster spot, but will now get a shot to show his form at the highest level of the minors. As Marc Carig of The Athletic recently documented (subscription link), Wright has to endure hours of preparation just to make it onto the field. Back, neck,and shoulder problems will continue to impact the veteran even if he’s able to filter back up to the majors. As Ken Davidoff of the New York Post explained at the outset of the season, this coming offseason will represent a decision point for Wright and the Mets. He’s on the 60-day DL for the time being, but will take up a 40-man spot over the offseason. With $27MM left to go on Wright’s contract, and an insurance policy looming large in the background, it’ll certainly be interesting to see how things play out. Meanwhile, Ricco explains that the hot-hitting Alonso wouldn’t receive much opportunity at first base in the majors late this year, with time slated to be shared between Jay Bruce, Wilmer Flores, and (once recalled) Dominic Smith. Of course, it’ll also mean that the 23-year-old Alonso won’t pick up any service time this season, making it easier for the organization to delay his promotion next season while still allowing him to play for much of the year. As ever, it’s hard to discern just how heavily the varying considerations weighed. In the case of Bautista, who was just moved for a marginal return, Ricco says the idea was to clear the deck for the team to find plate appearances for existing players (not including Alonso, obviously). Plus, the Mets preferred to “do the right thing by Jose,” allowing the veteran to join a pennant race. The Phillies have officially worked out a deal with the Mets to acquire veteran outfielder/third baseman Jose Bautista, as Joel Sherman of the New York Post reports on Twitter. Philadelphia had claimed the veteran on revocable trade waivers. New York will receive a player to be named later or cash to complete the deal, per Jim Salisbury of NBC Sports Philadelphia (via Twitter). Bautista is only earning the league-minimum salary, so he won’t cost the Phils much in dollars. The Phillies have already managed to squeeze in one defensively-limited slugger onto their roster, acquiring Justin Bour earlier in the summer. Now, they’ll shoehorn Bautista into the mix. Of course, active roster space won’t be an issue in a few days’ time, as rosters are set to expand on Saturday. The Phillies will need to tie up a 40-man spot in order to carry Bautista, though. Bautista is no longer the feared slugger of yore, and owns a sub-Mendoza batting average, though he can still drive the ball out of the park and draw a walk. His overall output on the season — .196/.339/.364 with 11 home runs in 342 plate appearances — translates to roughly league-average productivity (98 OPS+; 99 wRC+). Perhaps there’s an argument to be made, though, that Bautista’s exceptional plate discipline and remaining pop make him a particularly interesting late-game pinch-hitting option. And the organization no doubt knows that it’s infusing a fiery competitor into its clubhouse at a moment when the team seemingly needs a jolt. 1:57pm: SNY’s Andy Martino tweets that it’s “likely” the two sides will work something out, but there’s no agreement believed to be close just yet. Fancred’s Jon Heyman tweets that the Mets have told the Phillies they won’t simply let Bautista go on waivers, so it seems the two sides will have to match up on a minor leaguer or at least agree to a group of names from which the Mets can select a player to be named later. 1:47pm: The Phillies have claimed Mets outfielder Jose Bautista on revocable trade waivers, reports Ken Rosenthal of The Athletic (via Twitter). The two sides are discussing a deal and have until tomorrow to complete a swap, Rosenthal adds. Technically, the Mets could also just let Bautista go to the Phillies, though with the Mets only paying him the league-minimum rate, there wouldn’t be any real cost-savings associated with doing so; they’d have to replace him by calling up another player earning at that same rate. Bautista, 37, started out hot after signing with the Mets, hitting at a .266/.438/.506 pace with three homers and 10 doubles through his first 105 plate appearances with his new club. However, his offensive production cratered over the next few months, and he’s posted a dismal .178/.306/.307 slash in 193 plate appearances since that time. As Rosenthal points out, he’s swung the bat a bit better as of late, getting on base at a .368 clip over the past two weeks, but the veteran slugger simply hasn’t produced much since the calendar flipped to July. Then again, the Phillies may not be looking at Bautista as much more than a right-handed pinch-hitting option to carry throughout the month of September once rosters expand. He wouldn’t cost them anything more than the pro-rated minimum, and it’s likely that the cost of acquisition would be negligible. The Phils don’t have much in the way of right-handed bench bats on the current roster, nor do they possess many intriguing right-handed-hitting options at the upper levels of their minor league ranks. Aaron Altherr figures to rejoin the club, and Trevor Plouffe is still in the organization, but neither has been demonstrably better than Bautista at the plate in 2018. Journeyman Matt McBride and 26-year-old Joey Meneses are other righty bats who’ve had some success in Triple-A this season, but the roster could be expanded to give manager Gabe Kapler multiple options. Ultimately, so long as the Phillies don’t need to give up anything of real substance, there’s little harm in adding Bautista and his overall .340 OBP to the bench — even if the addition doesn’t do much to move the move the needle as the Phillies try to make up ground in both the NL East (3 games back) and the NL Wild Card race (2 games back). Even if the Mets trade Jose Bautista this month, it’s “likely” they’ll attempt to re-sign the soon-to-be free agent prior to next season, Mike Puma of the New York Post hears (Twitter link). Signing Bautista, whom New York added May 22 shortly after the division-rival Braves released him, is one of the few moves that have paid off in a disastrous season for the Mets. The Blue Jays legend has slashed a useful .215/.364/.390 with six home runs in 214 plate appearances during his two-plus-month run with the Amazins. 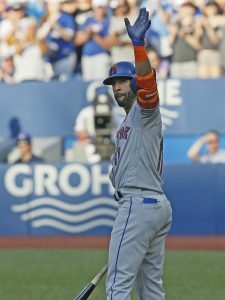 If he does continue his career in 2019, Bautista – who has primarily lined up in the outfield with the Mets after a short-lived third base experiment with the Braves – will play his age-38 campaign. The belief is Rays shortstop Adeiny Hechavarria has cleared waivers, Marc Topkin of the Tampa Bay Times tweets. If true, the Rays could trade Hechavarria to any team. Tampa Bay designated Hechavarria this week after watching the 29-year-old offer his usual blend of weak offense and strong defense in 2018. Hechavarria hit just .258/.289/.332 in 237 PAs, but he did total four Defensive Runs Saved in the field. He’s due around $1.9MM for the rest of the season, Topkin notes. Back to the Mets, who are in the midst of increasing catcher Kevin Plawecki’s playing time as they look toward 2019, Anthony DiComo of MLB.com writes. Plawecki started for the fourth time in five games Saturday and, per DiComo, is a lock to return to the Mets next season. The only question is whether the 27-year-old will start or serve as a backup. Current starter Devin Mesoraco is set to hit free agency in the offseason, meaning he’ll cede playing time to Plawecki down the stretch. The Mets can still control catcher Travis d’Arnaud for another season via arbitration, but injuries have long haunted the 29-year-old – including in 2018, which ended for him in early April on account of a UCL tear in his right elbow. Shortly after, the Mets lost Plawecki to a hairline fracture in his left hand, but he was able to return in late May. Injury aside, this has been a decent offensive season for Plawecki, who has slashed .231/.345/.372 in 142 PAs. Plawecki is scheduled to go through his first of four potential trips through arbitration over the winter. Mets outfielder Michael Conforto looked like one of the brightest young stars in baseball last season, his age-24 campaign, when he slashed .279/.384/.555 with 27 home runs and racked up 4.3 fWAR. Conforto piled up those stellar numbers over just 440 plate appearances before undergoing season-ending left shoulder surgery in early September, and because of that injury, the Mets went into the winter unsure of what he’d provide in 2018. To Conforto’s credit, he worked his way back to the Mets’ lineup a few weeks earlier than expected, making his season debut on April 5. At that point, New York was amid a red-hot start that would see the team collect 11 wins in its first 12 games. Two months later, the Mets are a lowly 27-34, owners of the third-worst record in the National League and the NL’s second-worst offense by runs scored (235). Even though he owns the majors’ 11th-best walk percentage (15.1), Conforto hasn’t really been part of the solution, having hit an uninspiring .219/.340/.365 line with seven homers in 212 PAs. The Mets even pinch-hit for him in the ninth inning of a one-run loss to the Yankees on Saturday, electing to sit the left-handed Conforto in favor of the righty-swinging Devin Mesoraco with southpaw Aroldis Chapman on the mound. Unfortunately for Conforto, there may be a more significant demotion on the way if he doesn’t turn his season around soon. The Mets have considered sending Conforto to Triple-A Las Vegas to work through his issues, Joel Sherman of the New York Post reports. The likelihood of that has decreased over the past day, Sherman notes, given that fellow outfielder Yoenis Cespedes suffered a setback in his injury rehab on Saturday. Had Cespedes remained on track, New York may well have optioned Conforto upon the veteran’s return. For his part, Conforto – whom the Mets previously sent to the minors during a disappointing 2016 – doesn’t believe he’d benefit from another trip to Vegas. While Conforto understandably wants to remain in the majors, the Mets may have an outfield logjam on their hands when Cespedes does come back. He and the emergent Brandon Nimmo will be guaranteed starting jobs, manager Mickey Callaway informed Sherman, leaving one everyday spot for the struggling Jay Bruce (in the first season of a three-year, $39MM contract) and Conforto. Both players are lefty hitters, so the Mets wouldn’t be able to simply platoon them, and Conforto has options remaining. As such, the Mets may send him down so he’ll continue receiving consistent at-bats. In another scenario, Sherman points out that Bruce and/or Cespedes could see time at first, which would perhaps spell the end of the Adrian Gonzalez era. The Mets brought Gonzalez in over the winter as a league-minimum free agent, but it hasn’t worked to this point. They’re mulling how much longer they want to go with Gonzalez, Jose Reyes and Jose Bautista – three mid-30-somethings whose best days appear long gone. Moving on from some or all of that group instead of demoting Conforto would seem to make more sense for a New York club that doesn’t look as if it’s going to contend this season, though it seems Conforto’s going to have to make a case for a roster spot as the team awaits Cespedes’ return. While Conforto’s bottom-line production has declined this year, his underlying numbers have also worsened. After running up a .385 expected weighted on-base average a year ago, he’s at .332 this season. That’s still above the .321 league average, though it’s not the borderline elite figure he posted in 2017, when he averaged a 95.2 mph exit velocity on fly balls/line drives and made 95 mph-plus contact on 43.2 percent of batted balls. This season, Conforto has posted a 92.3 mph mean on flies/liners and seen his rate of 95 mph-plus contact drop to 32.8. Further, Conforto’s line drive rate has dropped off considerably since 2017 (from 24.4 percent to 17.7), while both his groundball percentage (37.8 to 41.9) and infield fly rate (10.1 percent to 14.0) have increased to discouraging degrees. All of the above has helped add up to Conforto’s subpar start and may lead to a minor league demotion sometime soon. For now, he and his team, losers of eight straight (all at home), are left to dig out of a deep hole. Having scored just 10 runs this month, during which Conforto has batted .080/.207/.200 in 29 PAs, the Mets sit 8.5 games out in both their division and a crowded NL wild-card race. The Mets have signed Jose Bautista to a one-year, Major League contract, the team announced via Twitter. The veteran slugger has already been added to the Mets’ roster and is available for tonight’s game; Phillip Evans was optioned to Triple-A in a corresponding move. MLB.com’s Anthony DiComo reported earlier today that the two sides were progressing towards a contract, and FanRag Sports’ Jon Heyman reported that an agreement had been reached. The deal will pay Bautista a Major League minimum salary, Heyman tweets. With Yoenis Cespedes and Todd Frazier both on the DL, Bautista provides a right-handed bat capable of playing both third base and in the corner outfield. Bautista could also spell Adrian Gonzalez and Jay Bruce (both lefty swingers) at first base, to boot. The Mets’ media release about the signing (as noted by The Athletic’s Tim Britton) made particular mention of Bautista’s .913 OPS against southpaw pitching during his recent stint with the Braves, so it could be that New York will specifically deploy Bautista as a lefty masher. Bautista only hit .143/.250/.343 overall during his brief time with Atlanta, with his success in 20 PA against lefties counterbalanced by a measly .308 OPS against right-handed pitchers. It’s hard to draw too many conclusions from such a small sample size, of course, though given that Bautista didn’t get a proper Spring Training (he only signed with the Braves in mid-April) and he is coming off a sub-replacement year with the Blue Jays in 2017, it certainly seems like the 37-year-old might best be suited for part-time duty at this stage in his career. This is technically Bautista’s second stint in the Mets organization, as he was initially acquired by the team back on July 30, 2004 in a trade with the Royals for righty Justin Huber. On that very same day, however, Bautista was dealt as part of a three-player package to the Pirates for Kris Benson and Jeff Keppinger. One can’t really fault for the Mets for not knowing what they had at the time, as it wasn’t until 2010 that Bautista broke out as one of the game’s premier sluggers with a 54-homer season for the Blue Jays. That was the first of six superstar-level years for Bautista in Toronto, and he was still a solidly above-average bat as recently as 2016, though he was starting to show some of the signs of the decline that led to his ruinous 2017 campaign. Since the Mets needed some right-handed hitting, though, there isn’t much risk on the team’s end in signing Bautista to the low-cost deal to see if he can recapture any of his old form, particularly if Bautista’s exposure to right-handed pitching is limited.